An added bonus of stone garden ornamentation, is that it can be mobile and moved around the garden at a whim if it is not too heavy. Stone spheres are usually expensive and finding one, often a random lucky discovery on one’s travels. Good places to search are in architectural salvage stores. 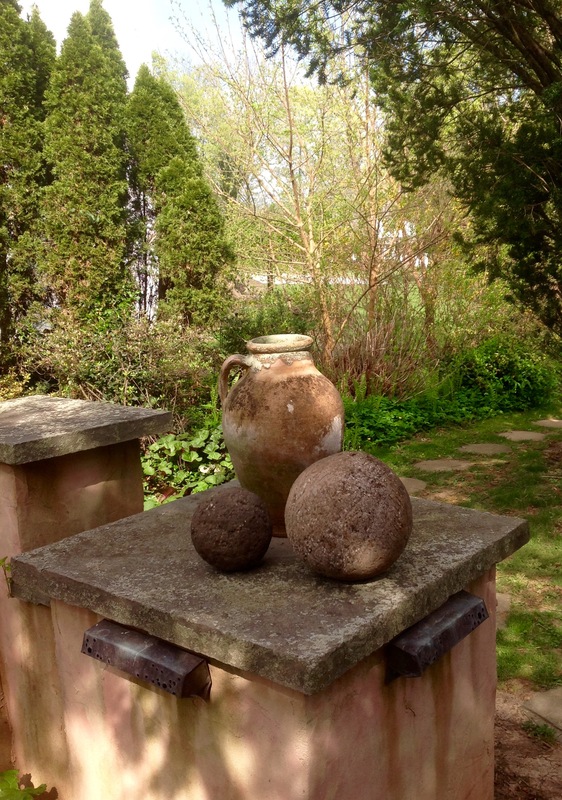 Two of my spheres invite attention on a garden wall alongside an antique olive oil urn. 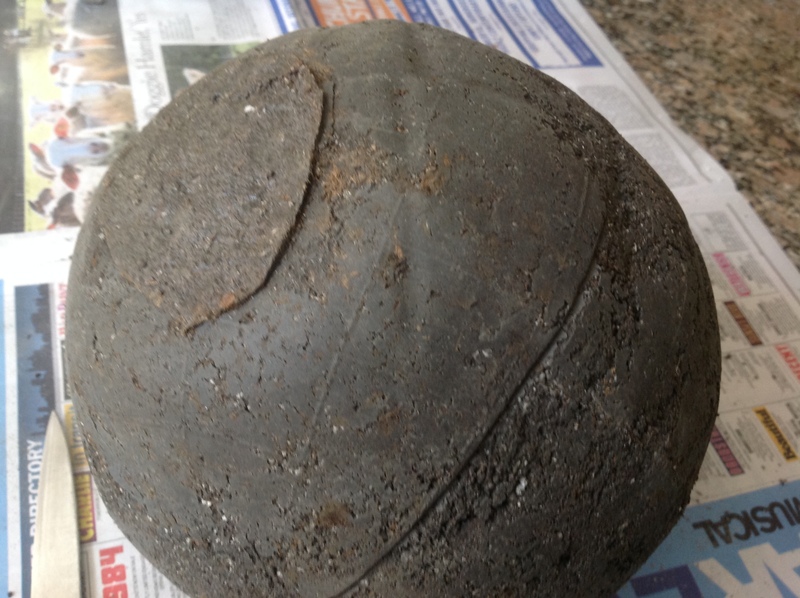 The brand new spheres have an ancient looking patina that blends perfectly with the old urn. 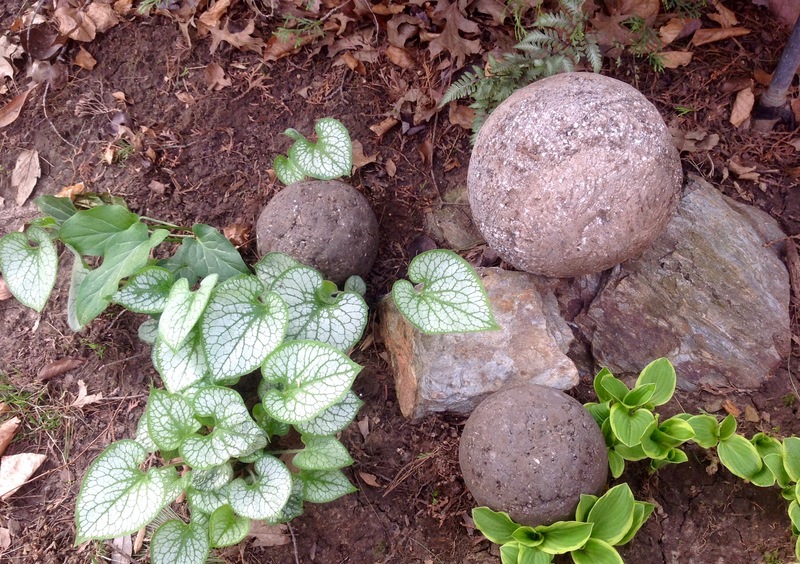 For many years I have been making hypertufa containers for my garden. It never occured to me to try making garden spheres. After some research I found instructions on how to make them and they were quite easy. I played around with 3 techniques and all of them yielded beautiful spheres. All the orbs I created were solid. In the first technique, I used an inflated ball as the mold. In the second technique, 2 round soup bowls without any rims were sandwiched together to serve as a sort of hinged mold. In the third technique, I shaped a small orb free hand. For all methods, I used the standard ratio of 1 part Portland cement, 1 part perlite and 1 part peat moss with just enough water to create a thick mixture. I just adjusted the quantity of the mixture to fill the molds. 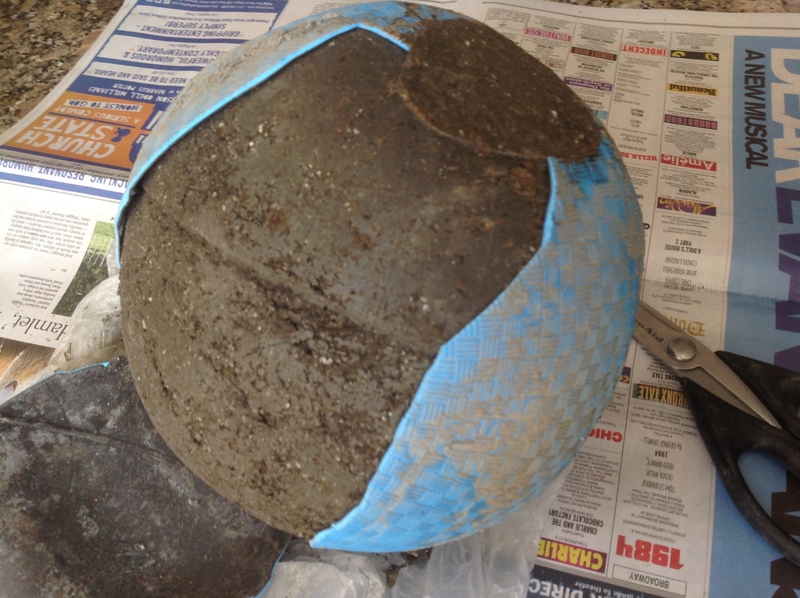 You will need a large bucket, a mask to protect you from the cement dust, rubber gloves, kitchen scissors to cut the top of the ball, a rubber ball to use as a mold, water, equal measures of Portland cement, perlite and peat moss and a box to secure the sphere as it cures. You will need a plastic bag large enough to hold the sphere as it cures. Cut a small opening on the top of the ball large enough to get your hand through. The ball will deflate a bit but don’t worry. When you add the cement, it will regain its shape. Add enough water to your mixture, and using your gloved hands, work it until it forms a thick paste. 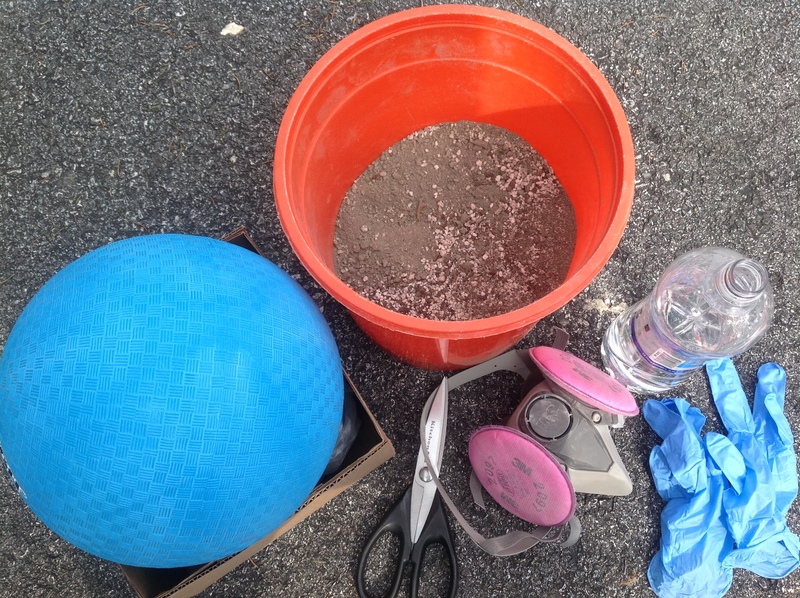 Start filling the ball with the hypertufa mixture until full. You will need to get your hand inside the ball often to really pack the stone into every nook and cranny. 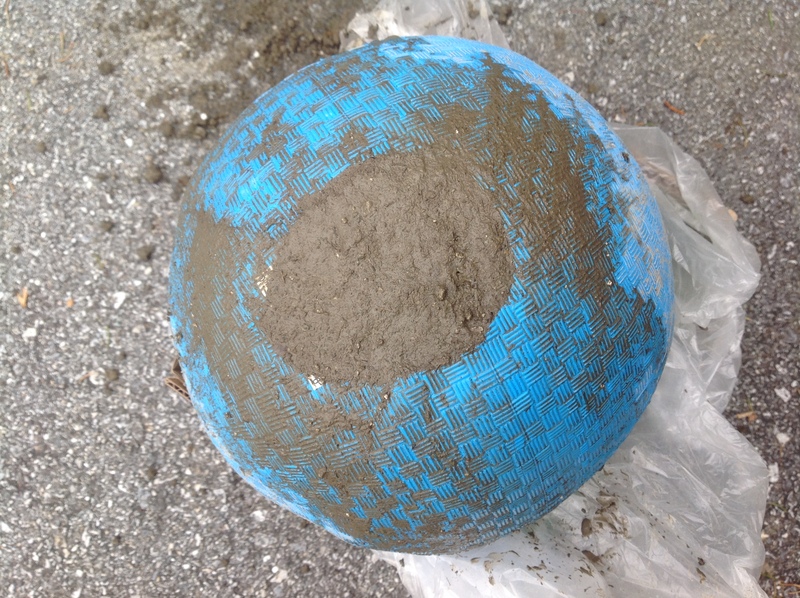 You will know you have it full when the surface of the ball is restored to its original shape. I was surprised at how much stone was needed to fill the mold and had not mixed enough the first time. I simply mixed a second batch and continuted filling the ball. Once it is full, place the ball in a plastic bag, tie it and secure it in a box to keep it immobile while it is setting. Cure an initial 48 hours in the mold. 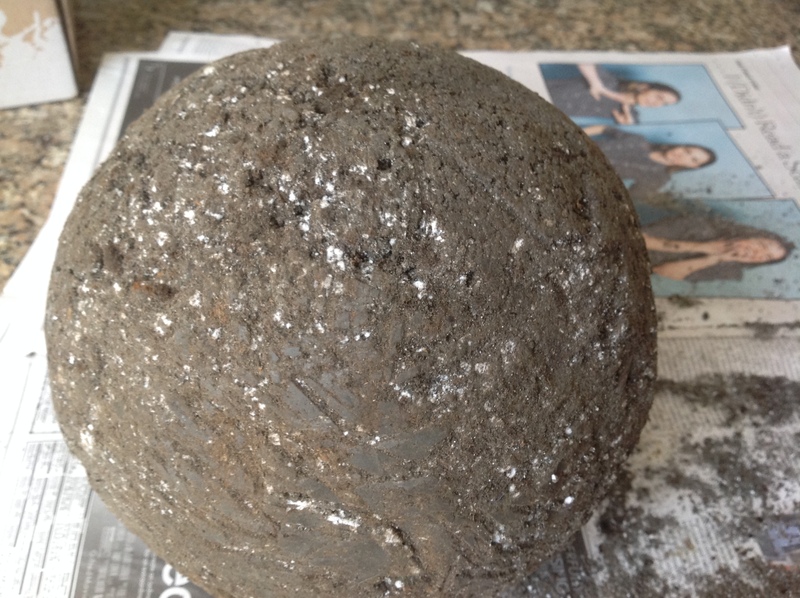 After 48 hours of initial curing: Using kitchen shears and working on newspaper, cut away the rubber ball and discard. Your sphere will have some markings at the top where the cut-out hole is. Mine also had a horizontal striation where I had run out of hypertufa stone and had to mix a second batch. At this stage, the cement is still pretty soft. So take a paring knife and gently scrape away to remove any lines you don’t esthetically like. The markings on my sphere before I remove them. The surface of my sphere after I carved away the unsightly markings. You could use sandpaper to achieve a similar result. 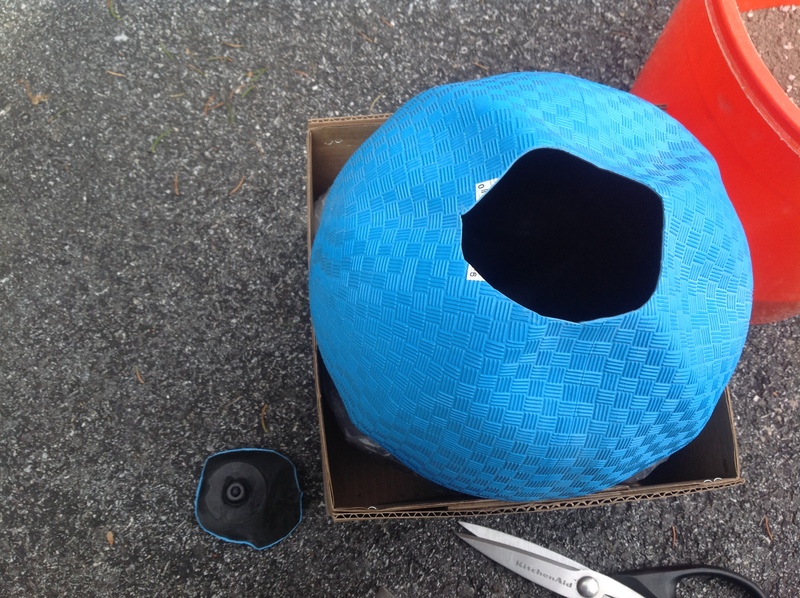 At this stage, rebag the sphere in the plastic bag and cure for a week, securing the sphere in a box to stabilize it. The second technique I developed was to use 2 rimless soup bowls from my kitchen that had a perfect rounded shape. For this technique, you must generously spray the inside of the bowl with cooking spray to be sure you can separate the mold. The rest of the technique is exactly as described above. I liked this technique as I could lift the mold and look at my mixture once it was packed in tight and use my hand to smooth any air bubbles. I also liked that I could reuse these soup bowls as subsequent molds. Because I only had 3 molds and I made 2 spheres at the same time, I let one half of the first one dry outside the mold. Both spheres cured the same way. The third way I created hypertufa spheres was free hand. 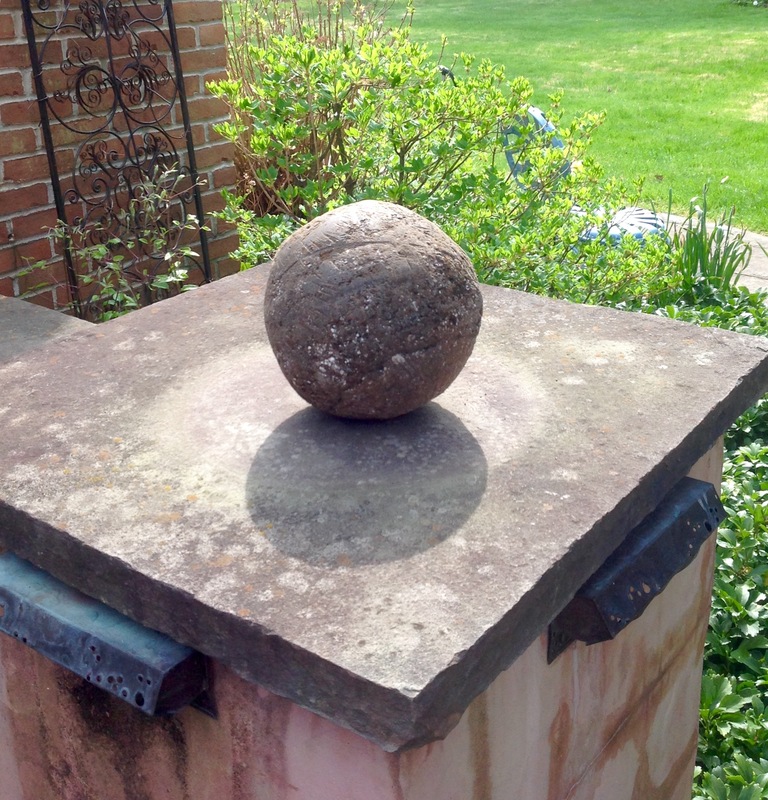 With some left over hypertufa mix, I created a finial for an antique cloche bought at Eastcote Lane, Devon, PA). I really like the organic texture of the finial against the glass. After shaping the finial, I notched the bottom with the rim of the cloche by spinning it on the rim a few times so it would lock into place once dry. I let it cure in a plastic bag for a week like with all the other spheres. I just love the way this little finial turned out. My friend Inta is perhaps the gardener I admire the most for her expert eye at integrating architectural elements masterfully in the garden landscape. Plants remain the focal point in her garden while architectural salvage and other sculptures provide unique punctuations of texture and interest. You can visit Inta’s incredible garden here to be inspired and mesmerized! 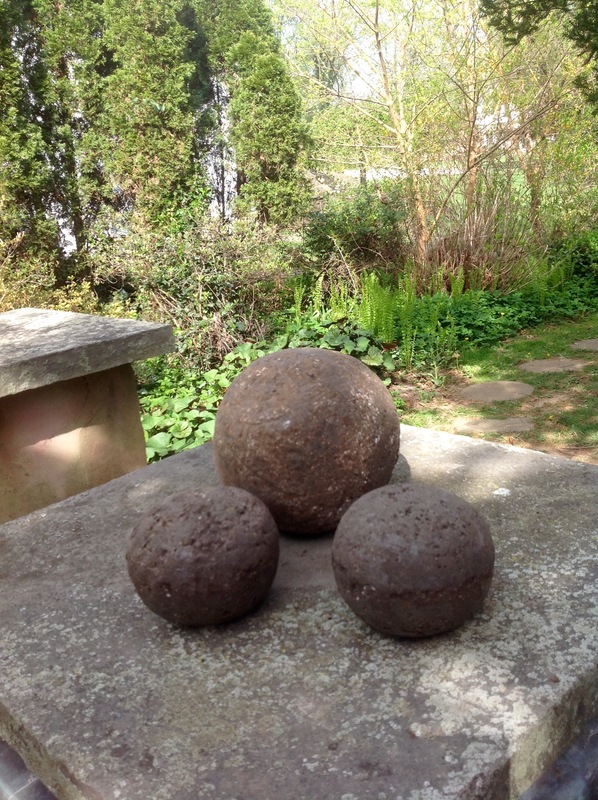 I hope you have enjoyed learning how to make hypertufa garden spheres with me today. These examples were my very first attempts at making them and I assure you they are easy to make. In a future post I will share how to grow moss on these hypertufa spheres. One of the deterrent to making hypertufa projects is that Portland cement is sold in 96 lb bags. My awesome local hardware, Do It Best in Wayne, PA, repackages broken bags into 10 lbs bags for small projects which they sell for a few dollars. It’s worth asking if you can purchase a smaller amount. I made all 4 sheres with just one 10 lb bag of cement. This entry was posted in Crafts, Gardening and tagged diy hypertufa garden spheres, Hypertufa spheres, making garden spheres, making hypertufa spheres with ball moulds, making hypertufa spheres with bowls as moulds, solid hypertufa spheres, tutorial on making hypertufa spheres by Johanne Lamarche. Bookmark the permalink. I’m so happy to see you are the first one to comment Loretta! I knew you would appreciate this post. So fun and easy. They look a million years old which is what I love about the material! 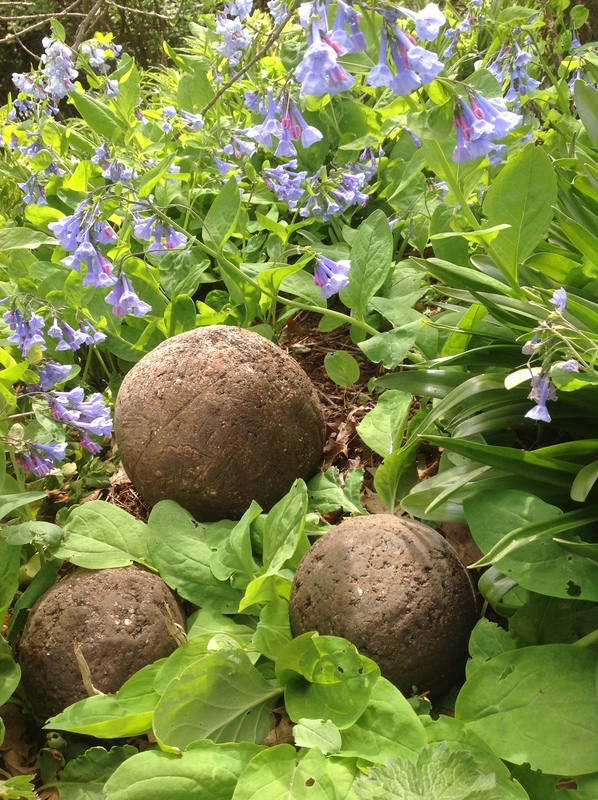 You had a ball doing these and they are very nice accents for your garden. A rolling stone gathers no moss! You are not afraid to get your hands dirty. And you my friend, always make my day! I’m SO impressed. You are so handy & creative- and I know your garden is amazing! Aren’t you the clever one Johanne, you made your own rocks!! Fabulous! !